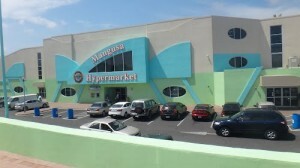 WILLEMSTAD – Another popular supermarket, Mangusa Hypermarket was also visited by the Inspectorate of the Ministry of Economic Development (MEO). Here, MEO also found several expired products that were still on the shelves. For example, some chicken meat which expired in 2015 and was still in the freezer for sale. In addition to these expired products, about 30 warehouse workers were found that did not have their work permit with them. They tried to run away when the saw the police. In this case, too, it was an intensive and wide-ranging inspection involving police officers, the Ministry of Social Development, Labor and Welfare, the tax accountancy agency BAB, the veterinary service and the Social Insurance Bank. The inspection has been ongoing since last week at mini markets and supermarkets, including Tuesday at Centrum Supermarket at Mahaai. There the authorities found a freezer full of expired products.